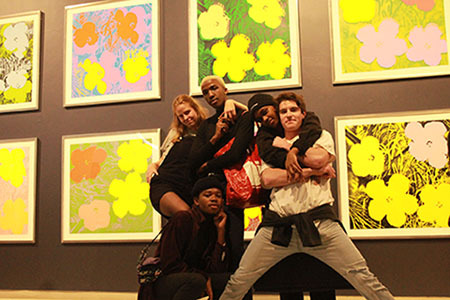 WITS ART Museum (WAM) opened its doors to the public on Wednesday, July 27, for the first public viewing of Andy Warhol’s artworks. The 80-piece travelling artworks are displayed over three floors of the WAM, and include the famous portrait of Marilyn Monroe, the Campbell’s soup cans and the endangered species series. Curator Lesley Cohen said that exhibiting Warhol’s artworks was an opportunity that WAM could not refuse. “He is an absolutely iconic international artist,” she added. WAM had received an “amazing” response from the media and public, with over 1,500 people confirming their response to attend the opening night, according to Cohen. WAM was filled with art lovers and Warhol fans who have been inspired by his artworks. Abi Meekel said that she had studied Warhol in high school “and now it’s here and I feel like I can actually see it in person and I always wanted to see Andy Warhol’s stuff”. “I’ve always been for Andy Warhol and the whole art movement because it just captured the whole essence of fun things of that period and time but besides that, we’ve actually got the unofficial first stadium red pack showing and the cans downstairs, Marilyn Monroe and beyond that I’m humbled and inspired,” said Khotso Masilela. The Warhol exhibition will be at WAM until October 8.